Hawaii Nature Retreat is centrally located between Kona and Hilo in the private and secluded Wood Valley, a wonderful, get away from it all. 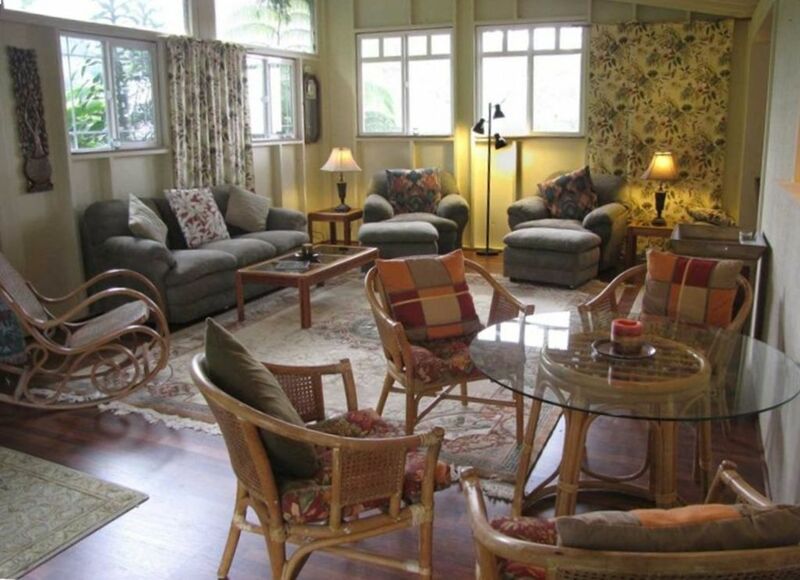 Historical, 5 bedroom Plantation House, perfect for a couple, family group or small seminar. Everything you need (except food) is provided. 12 acres of scenic beauty, surrounded by the tree-studded flanks of Mauna Loa. •30-Minutes to Kilauea Volcano National Park, See Lava! •15-Minutes to Punalu’u Black Sand Beach, Swim with the Turtles! •10-min Ka’u Coffee Mill - International Award winning Hawaiian Coffee! •Beautiful Coastal Hikes - Visit Green Sand Beach at South Point. The property feels like your own nature reserve. Quiet, serene and full of singing birds. Watch Io (Hawaiian Hawk), Pueo (Hawaiian Owl), Finches, Turtle Doves, Cardinals, and hundreds of Mynah birds that nest nightly in native Bamboo trees. •Private bath house, and outdoor shower. •BBQ Grill on covered outdoor patio. Great for entertaining. •Grapefruit, Oranges, Lemons, Bananas, and Mac nuts to pick. •Amazing stars surround you out in the bonfire circle. •Gazebo Stage in the field used for Yoga, various ceremonies, meditation, and music. •Wood Valley has a two mile road loop great for nature walks day or night. •One mile walk to the Wood Valley Tibetan Buddhist Temple. •Secret beach hikes such as Kawa’a beach and others near by. Your group is free to explore the acreage. Indigenous Hawaiian Garden, and Water Lily Pond. Walk through the Grass Maze into the Ceremonial Circle with Meditation Platform. Views of the Pacific Ocean, Sunrise and Moonrise. Visit Hero the Goat, and feed the sheep and chickens. •The owner Sandra lives a in a small house on the far side of the property, one city block away from the rental house. •Two guest houses on the property are used by our caretakers. •Home is located convenient to an easily accessible rural road. •Pure spring water for bathing and drinking. No need to buy water! We stayed here on vacation and fell in love with this property 16 years ago. We decide to retire early and live off of the organic gardens here: we didn't know how to farm yet! The last 16 years has been so much fun and gone so fast; we actually believe we died and went to heaven because it has been so wonderful. . Rich is a retired electrical engineer/physicist with an interest in the Universe Story. Sandra is a retired teacher, holds a masters in transpersonal psychology, and is a master photographer (Google search on Sandra Lee Reha). Sadly, Rich passed away in 2010. As stated, We fell in love with the property. That feeling only grows as a beautiful life here continues. No street lights or signs ensures the rural life is perpetuated. No pesticides have been used here for over 30 years, so the birds love everything, including free bananas, figs, other fruits, and we have hundreds of wild birds that return to our bamboo patches over night. There are no street lights in Wood Valley, and only a few houses, so at our 2400 foot elevation, the andromeda galaxy and the milky way are magnificent: better than I have ever seen anywhere. Children love to hand feed our tame goat, and some of our sheep herd. We have a harness for the goat to pull children around the property in our wagon. Last but not least is the spectacular Spring Water: bathe and drink the purest water on the planet, only a few minutes from its spring source with no storage or chlorination: only pure water. The main bathroom is separate from the house. It is 10 foot walk outside from the back entrance. It has a walk-in shower, a toilet, sink and a secluded tub. See pictures. The bathroom inside the house has a toilet and a sink. Amongst the lush, serene hills of wood valley. Many farms, clear sun rises and star light. In the very center of Wood Valley surrounded on 3 sides by mountain views. A few miles line of sight to the Ocean. Near Black Sands Beach Swim with Turtles. 10 miles of breath taking hikes and views. Great beautiful lawn perfect for weddings. Large outside covered patio. Table seats 6 for dinner. Screened cabana room. 8 x 8.5 foot cedar steam house seats 10. 104 foot diameter fire circle seats 20, Meditation gardens, and fruit trees. Sun porch sleeping for morning sunrise. Larry and I love historic, character homes and this one was no exception! Lovingly restored by our host and her late husband, we were charmed by this peaceful country home. As each special detail revealed itself, we felt the stresses of home melt away. For just the two of us, it was a lot of house, but we each found those special nooks where we could settle ourselves and enjoy the serenity. The funky bath area stands out, of course, but there are others. Cool nights melt away as the sun rises on the little sunroom, which is the best place to capture the morning’s emerging warmth. Larry enjoyed the fruit trees and practiced his harvesting skills with the ‘picker tool’. Our host, Sandra, brought us a big bag of macadamia nuts which he joyfully shelled - this was not as easy as you might expect! Every day I wandered the property and surrounding neighbourhood in search of new flowers and blossoms, some to admire where they grew and others to bring back and enjoy. And then there were Sandra’s sheep!! Their contented bleeting could often be heard from the house, ramping up as they see you approach with food in hand. Four little lambs were born just before we arrived! What a treat to cuddle them - so cute. I’ve read past reviews on this home. Some say a couple of days here is enough - we were here for a week and would have happily stayed longer. This area has many interesting places to visit & explore, many off the beaten path. Some said not great for kids - wrong! This is a child’s adventure place, IMO! The most important thing to remember is you’re in a century home in the country. Don’t expect a modern house or the sterility of a hotel room. This is likely what we’ve heard referred to as ‘Old Hawaii’. We feel honoured to have had the opportunity to,stay here. But thought this will be the high point of your trip. Do you have any idea how happy that makes me? As you noted, me and my helper work so hard to make this the best experience for everyone and all ages. Of course it takes constant effort and sometimes in the semi-tropical location we might miss some detail. But believe me, we give it our best for our visitors. I'm so grateful you understood that. Prettier and thank you so much. I' learned a lot. I'd like to try and do as well. Thank you for your cleanliness. Wish you were my neighbors. Stars, birds, valley view, and fruit! We arrived in Pahala on a rainy evening after driving from Hilo leisurely with meals and stops along the way. The first pleasant surprise was to find the kitchen stocked with some basics for breakfast, snacks, drinks, and a meal in a pinch. There was a variety of citrus fruits as well and with the limes/lemons there was sugar to make limeade or lime sodas (seltzer in the fridge). Take advantage of neighbor's offer of farm fresh dozen eggs for $6 (coffee and bread available too, or all together in a bundle). Sandra invited us to gather ready greens from the garden as well and threw in some avocados and mac nuts (can be eaten raw, or roasted out of both shells, and tossed with oil/salt). Don't miss exploring the grounds around the house or spending some time checking out the stars at night (we didn't get out to Mauna Kea this time, so this was the best opportunity). We also took a drive around the loop of the valley though walking on the road is fine given how little traffic there is. There's toys and games for the kids, but the nephew and nieces probably didn't even need those to be entertained in such an house that was interesting to the young and old. The house is at 2500 ft. elevation, so when some of us tried baking we did get some dense/flat cake results that call for possible adjustments due to altitude. Do note (shown in video) that the last bedroom is detached from the house - maybe trickier for those who get up in the night, but does provide great view of the stars at night. It was fantastic. Beautiful, peaceful, unique. We were worried about the volcano but we ended up hardly noticing it at all except for the red glow from the plane which was really cool. We swam with the turtles at the black sand beach, drank coffee at the local coffee grower up the street, had a fire under the stars and had a great time. Aloha to this family. They were the best ever. A total honor to have all. 9 of them here during these somewhat challenging times. They get it!!! A lovely, quiet, homey place. Loved the outdoor shower/tub and the lush grounds. It's quite remote, and probably better for those without a super-packed sightseeing agenda, because you'll want to linger and enjoy the surroundings. That said, it really didn't take all that much time to get to the national park, the beaches, or Hilo. We managed to see everything we wanted to see, and the extra driving was not a big problem. Recommended for families especially! You were great guests! I appreciated your wonderful comments about your stay. You have a great attitude in general. Lovely people. Always welcome. The property has local historic interest in that it (as we understand) has been used at some point for plantation living for workers or owners. As such it is not a modern home, but an enriching experiencing allow one to consider what life might have been like on a plantation. The property owners have been creative to provide the usual comfort features often expected in properties. Also, the property is located in a tract of rain forest and the owners are enhancing the property's natural aspects. We like birding and immensely enjoyed walking the property and sitting on the veranda listening to the birds in the morning with our coffee. Wonderful for me to read your down to earth review. I always encourage guests to enjoy morning coffe on the sun porch. There are sooo many cheerful birds, just make your day. We do try hard to make the visit authentic and memorable. So glad you got the message. Your review is much appreciated. Wonderful house and gardens, plenty of room, great rural location! Peace, quiet, beautiful nature! We had a fantastic stay at Sandra's. She is a truly lovely and generous host! The property is dreamy, and a wonderful taste of real Ka'u! Scuba diving, Buddhist chants at temple 1 mile away, cliff diving into turquoise ocean at South Point 45 minutes, See the Awesome Milky Way without any light pollution. Diversity of plants, birds and flowers. No Smoking Inside Additional cleaning fee ($50-$100) depending on number of guests and duration of stay.